Hi everyone! I am Alesha, mom blogger behind Full Time Mama, and I am thrilled to be writing for Heather here on OurKidsMom! When I was thinking on what to share with you here, I decided a delicious recipe would be appropriate. It wouldn’t be too hard for me to write up a recipe post (I enjoy cooking and host a recipe link up every week on my blog), but then Heather said it would need to be vegetarian. Ah, a challenge! My family doesn’t eat much without meat in it, and I don’t ever think to find or make a recipe without meat in it. I couldn’t wait to figure something out and see how it would go over with my family! So, I decided on an easy lasagna. Here’s what I came up with, and my family loved it! I hope you do too! Best part about this is that you don’t have to precook your lasagna noodles; they cook up while the lasagna bakes! Prepare sauce: heat butter in skillet over medium heat, brown onion and garlic. Stir in crushed tomatoes, tomato past, tomato sauce, and water. Season with sugar, basil, fennel seeds, Italian seasoning salt, and pepper. Simmer, covered for about 45 minutes, stirring occasionally. 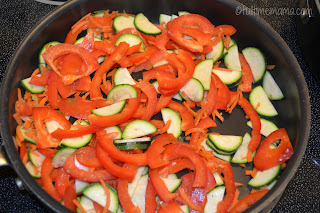 Heat butter in skillet over medium-high heat and cook red pepper, zucchini and carrot, stirring occasionally, until tender (about 4 minutes). Rinse spinach and chop. 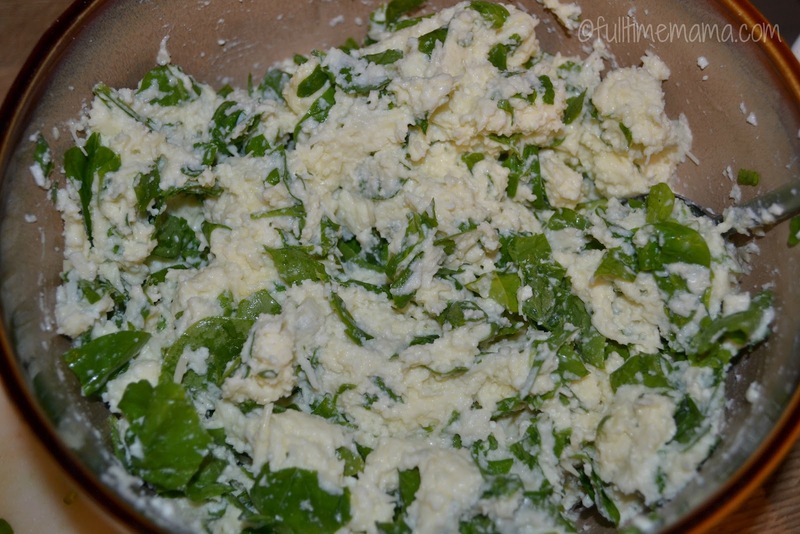 Combine spinach, ricotta cheese, 2 cups mozzarella cheese, 1 cup parmesan cheese and eggs in medium bowl. Spread 1 cup pasta sauce in 13×9-inch baking dish. Layer 4 uncooked noodles, then 1 cup sauce, half of the ricotta mixture, half of the vegetable mixture; repeat. Top with remaining uncooked noodles and 2 cups sauce. Cover tightly with aluminum foil and bake at 375 degrees for about 45 minutes. Remove foil and top with remaining mozzarella and parmesan cheeses. Bake uncovered for another 15 minutes. Let stand for 10 minutes before serving. Thank you Alesha! Be sure to stop by Full Time Mama and say HI! 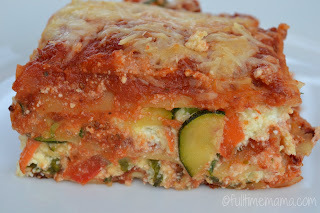 I love lasagna and love that this is a veggie lasagna. I have never made a veggie lasagna before, nor use parmesan cheese. Sounds wonderful. I need to make it. Thank you for sharing and the recipe! This looks really good! I was surprised that the personal trainer I had a meeting with told me pasta was still okay to eat, so I like this even more. Without the meat, it’ll be even more in line with my current goals. 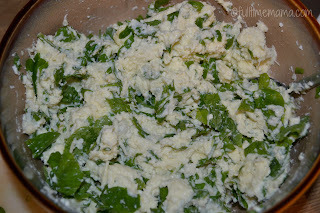 I love ricotta and mozzarella (any cheese really…) so I am sure I would love this! Thanks for sharing! Wow this looks amazing. I can’t wait to make the recipe. Thank you so much for sharing. Hi Alesha! I love lasagna! I really like your use of fresh ingredients. I’m so hungry for lasagna right now! 🙂 Thanks for sharing your recipe! I have never made a vegetarian lasagna before because my family like yours do not eat much without meat. I love lasagna and this looks so delicious. I am definitely going to give this recipe a try. Thank you for sharing! Thanks for showing me how to make this. I was hesitant at first because I love meat but this turned out so very good. 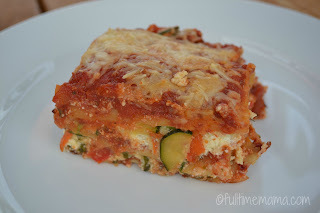 I love veggie lasagna! In my opinion, it’s tastier than regular lasagna. I’ve been wanting to try a meatless lasagna and this looks and sounds perfect. I’m going to give it a try! Looks healthy and delicious (2 things which in my mind rarely go together). My sister made veg. lasagna once and gave me a piece to try and I love it. I did not expect that since I’m not a real big vegetable fan. I have yet to find a vegetarian lasagna recipe which I am thrilled about, I might have to try this one. So ncie good s psot so well ncie great! That looks amazing! I just love unique veggie recipes, can’t wait to try this one out. I tried this and it was wonderful. Loved how all the veggies blended together. Thanks again for sharing. this looks amazing alesha,thank you for sharing. Great recipe. I have pinned it for future reference as I love meatless dishes. Thank you!